Ever Wonder What Is The Best Pickleball Paddle For Spin? For pickleball players, the amount of spin generated off the paddle is one of the most important elements of the game. For those who emphasize spin as part of their approach to playing pickleball, it is important to find a paddle that allows you to maximize the rotation of the ball as it comes off the paddle. This means having a paddle crafted from certain materials and ergonomically designed so that you can maximize your ability to spin the ball. 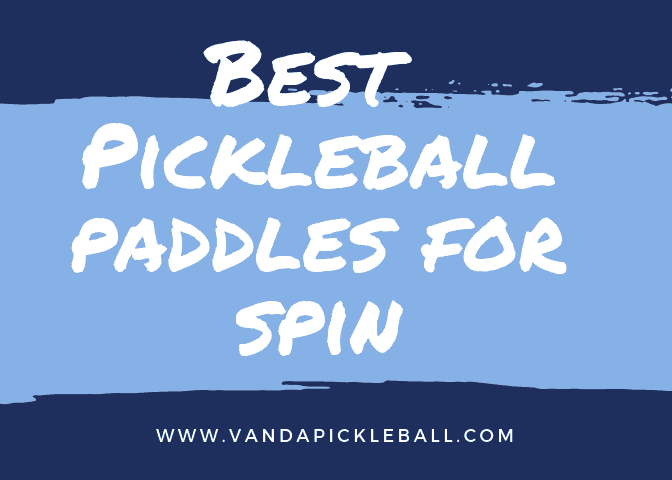 What follows are a few choice selections for pickleball paddles that emphasize spin without taking away other aspects of your game. If you want to maximize your ability to spin the ball as it comes off the paddle, you’ll want to check out these products first. Because of the materials used, this is a lightweight pickleball paddle that offers a superior surface for spinning the ball. Combined with a traditional, yet quite comfortable handle, this pickleball paddle by Amarey offer excellent ergonomic grip combined with the versatility to hit the ball as you like it to maximize spin potential while reducing fatigue. The key to the spin action is the graphite surface and honeycomb polymer core that provides an excellent feel and is perfect for beginners. Plus, at under $40, this is an excellent pickleball paddle to get started in the sport. A very light 7.6 oz. paddle complete with a textured surface crafted from fiberglass, this remarkable pickleball paddle offers the great combination of greater control, additional spin, and ergonomic design all in a fairly inexpensive product. The 4-inch surface provides plenty of play, but it is the honeycomb construction that really makes this a great paddle for those who want more spin on the ball. It meets all USAPA specifications and it has an ergonomically-designed grip that absorbs sweat, so you never lose control. A great change-up paddle for your game, it is also well-priced to be your first pickleball paddle, so you can start to enjoy the benefits right away. For a moderately priced pickleball paddle, it is perfect for those who want to maximize spin thanks to the SPINtac surface. This means that you have greater control over the spin of the ball when striking it thanks to the unique surface material. Using a QuadCore polymer honeycomb construction, the paddle is lightweight, yet highly durable for years of use. The paddle is USAPA approved and it also absorbs some of the noise, making it perfect for use in quiet neighborhoods. The ergonomic design combined with the unique materials on the surface means that you can increase the spin considerably on the ball while also exerting greater control. It is a bit pricey at about $100, but it may be the last pickleball paddle you purchase for a long time. If you are looking for a pickleball paddle for spin, then you should start with one of the products listed above as they provide what you need at a price you can afford.